LIQUEFACTION: The Imja Glacier below Mt Lhotse has melted to form a lake where there was only ice 30 years ago. Every morning Gian Pietro Verza walks up the lateral moraine of the Khumbu Glacier to take measurements as the wind makes colourful prayer flags flutter noisily. That same wind carries soot particles that is melting the mountains faster. The Italian scientist and mountaineer has been working at the Pyramid International Observatory below Mt Everest since 1987, and has seen the rapid retreat of the glaciers around him even in the last 25 years. "The ice used to come right up to there," he says, pointing towards the jumble of boulders and gravel in the Khumbu glacier, "now it has retreated up beyond base camp." 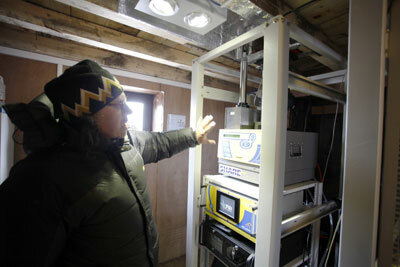 Agostino Da Polenza and the late professor Ardito Desio set up the Nepal Climate Observatory Pyramid (EvK2Cnr) in a unique collaboration between the Italian Research National Council and the Nepal Academy of Science and Technology, at an altitude of 5,050 m in Lobuje. The EvK2Cnr has been researching the effect of global warming on the Himalaya, and recently turned its attention to the impact of 'black carbon' on accelerating the melting of ice and snow. 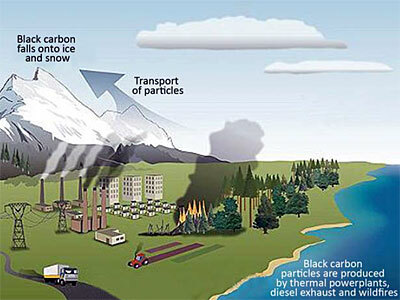 Black carbon is essentially fine soot and ash produced by diesel exhausts, thermal powerplants, brick kiln smokestacks and forest fires, and should not be confused with gaseous carbon dioxide. The United Nations Environment Programme says there is evidence increased black carbon deposits on Himalayan glaciers make them absorb more sunlight, accelerating glacial and snow melt. "Although glacier melting is predominantly due to global temperature rise, the deposition of pollutant particles like black carbon can enhance this effect," says Paolo Bonasoni of the Italy-based Institute of Atmospheric Sciences and Climate (ISAC). Wind-blown ash from huge pre-monsoon forest fires and their deposit on glaciers may reduce the albedo effect (reflectivity) of the snows by about five per cent, and deposits have grown three-fold in the past 40 years, researchers say. Arnico Panday, lead atmospheric scientist at ICIMOD, says: "It has been accepted that black carbon contributes to accelerated glacial melt, what remains is only the quantification of the effect for concrete analysis." 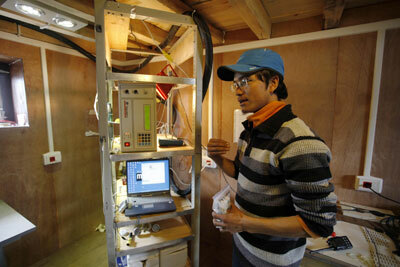 Laxman Adhikari with the black carbon measuring equipment and a trekking lodge spews smoke in Chhubung. Historical emissions of greenhouse gases by industrialised nations have traditionally been blamed for melting of the world's permafrost, leading to sea level rise. Today, India and China have overtaken the rich countries in total greenhouse gas emissions, and there has been a big increase in their black carbon generation. Nepal's delegation at the Rio+20 Summit in Brazil later this month will be arguing the country cannot sacrifice economic growth to save the environment, and will demand compensation to adapt to the impact of climate change. 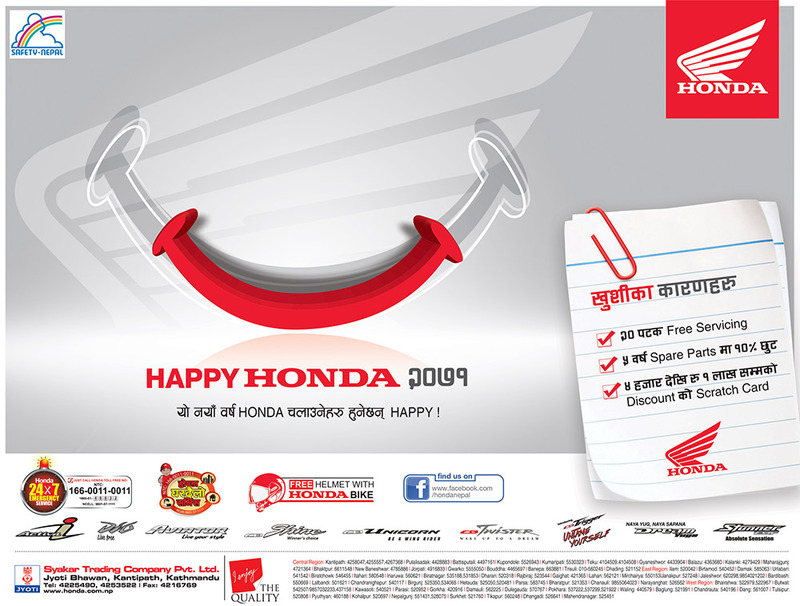 Increasingly, however, that is looking like an excuse to not address pollution in our own backyard that is contributing to the melting of the Himalaya. 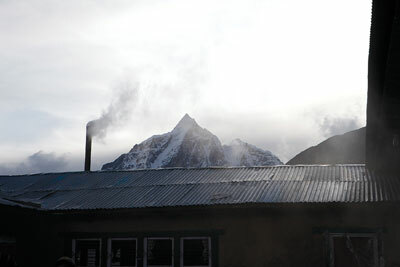 The locals of Khumbu have also been feeling the heat in the Himalaya. According to Lobsang Shrepa, a hotel owner in Dingboche, a village in the Khumbu region , many small water bodies have become larger including the Imja lake. Says Lobsang: "The glaciers maybe melting faster because the number and size of the lakes around here have increased significantly." 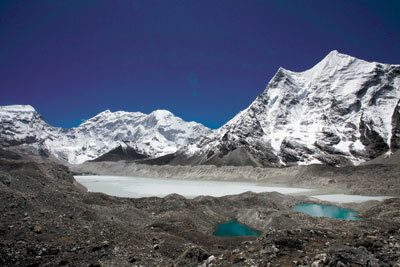 He fears the outburst of such lakes, especially the Imja, which lies above Dingboche might cause havoc downstream. Most of the locals also expressed concerns over varying weather patterns. 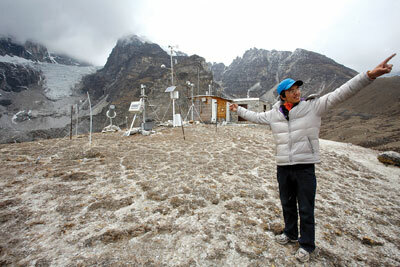 "It rarely snows for this long in May", says Pasi Tamang of Namche about the heavy snow fall last month. Says Pasi: "The winter has become milder over the years and weather pattern in the past few years has been puzzling me." Scientists discount anecdotal evidence of freakish weather, but say evidence of glacial retreat, receding snowlines are rapid and undeniable. They are trying to find which of the root causes are most to blame: natural warming after the Little Ice Age 600 years ago, global warming caused by carbon dioxide emissions, and more recently, deposits of black carbon soot on the snows. north-south shift in rainfall patterns in eastern China. Scientists say that instead of using global emissions as an excuse to do nothing, countries in the region should immediately start working on reducing solid pollutants caused by their increased use of fossil fuels. This would not just slow the melting of Himalayan permafrost, but also save them money from more efficient fuel-burning. While it might take some time to cut emission from industries, simple lifestyle changes like switching to improved cooking stoves in the mountains would also help. "Promoting clean air initiatives would address glacial melting as well as indoor pollution," says Raju Laudari of the Alternative Energy Promotion Centre in Kathmandu which promotes clean cooking stoves that reduce firewood use by a third. 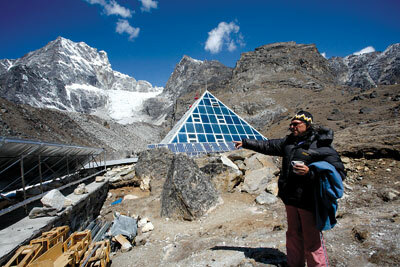 Back at the Pyramid in Lobuje, Laxman Adhikari helps monitor the instruments measuring black carbon. He has noticed the Khumbu Glacier below him recede further and further up the valley, and says: "If it keeps on melting at this rate, I don't think my children will know what glaciers are." *Gian Pietro Verza was identified as Agostino Da Polenza. We regret the error. 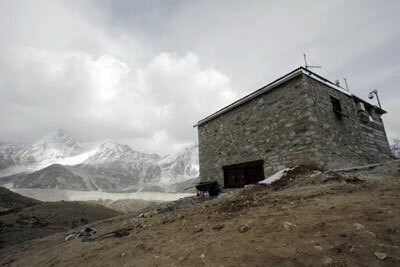 There are two types of carbon that cause Himalayan snows to melt. One is gaseous carbon from fossil fuel burning that has been heating up the atmosphere through the greenhouse-effect. The other is tiny particles of solid carbon given off by incomplete burning of diesel and coal. India burns 25 million tons of coal annually just to fire its brick kilns. Kathmandu brick kilns are responsible for half the air pollution, and in winter it sits at ground level due to temperature inversion. The soot particles from the smokestacks mix with diesel exhaust to form a layer of soot over southern Asia that is thousands of kilometres long and up to 4,000 m thick. Prevailing winds waft them over Himalayan glaciers, melting them faster. There are cleaner brick kiln technologies available, but cost and lack of government enforcement in Nepal and India have kept the old stacks belching away smoke. Greentech in India has tried out improved kilns that ensure more complete burning of coal, saving fuel and cutting soot emission. Similar projects have been tried out in Kathmandu, and the BrickClean Network has been encouraging kilns to clean up their act. Baking hollow bricks would also save money. The best alternative may be to do away with kilns altogether and work with Compressed Stabilised Earth Blocks (CSEB) in which clay is mixed with cement in a 96:4 ratio and compressed with a manual compactor. The resulting bricks are even stronger than kiln-baked bricks, and do not pollute. Want to see what the weather is like on Mt Everest in real time? 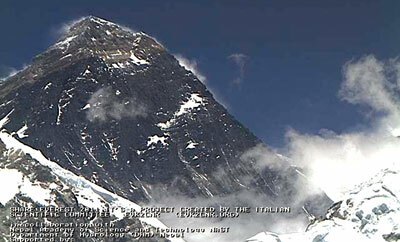 Thanks to the SHARE Everest 2011 project, EvK2Cnr, Nepal Academy of Science and Technology and the Department of Hydrology and Meteorology have installed a solar-powered webcam at Kala Pathar (5,675 m). The camera has broken the previous record for the highest camera on Mount Aconcagua in Argentina. The webcam is resistant to high wind and low temperatures and transmits images via wireless to the Pyramid at Lobuje during daylight hours, which are then uploaded live onto the internet. Nice article. Reading this, i got to know how black carbons are given off and how they do affect the Himalaya. A knowledgeable article to me. BR, thanks for bringing this timely and interesting article. Apart from the contemporary monitoring, we should develop a framework of a long-term/historical change of black carbon deposition in the Himalayas, then identify the tipping point, a benchmark where we should keep trying to reduce the current level of pollution. One way of doing this study could be the palaeolimnological investigation of the carbonceous particles deposited in the glacial lake sediment. Scientific communities should work together using a range of approaches for better understanding of the fragile Himalayan environment and their conservation and management strategies in future.